Shirla Rensink was born on July 27, 1925 on the family farm in Lime Lake Township, Murray County, Minnesota to Frank and Ida Olson Schaeffer. She grew up on the farm and graduated from Slayton High School as the Valedictorian of the class of 1943. Following high school Shirla worked for Dr. Williams in Slayton. On November 18, 1945 she and Floyd Rensink were married at the United Methodist Church in Slayton, MN. Following their marriage the made their home in Slayton. In 1949 they moved to Cokato, MN for one year before returning to a Slayton. Shirla work at the Murray County Extension Office for 25 years retiring in 1987. Floyd passed away on December 10, 1994. Shirla passed away at her home on Friday, August 24, 2018 at the age of 93. She was an active member of the United Methodist Church in Slayton where held several offices, taught Sunday school and sang in the choir. 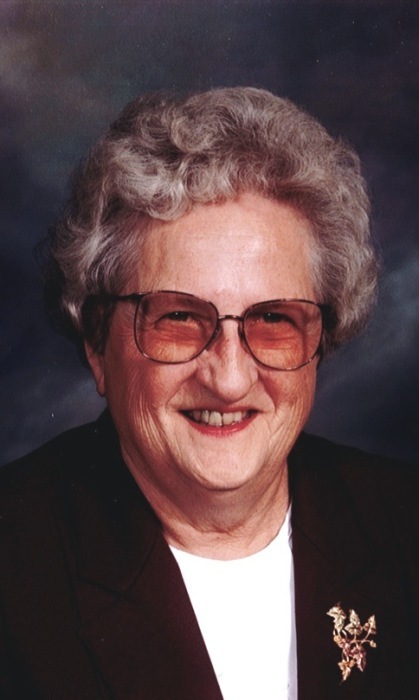 She also was a member of the Slayton American Legion Auxiliary for over 55 years. Shirla spent many hour volunteering at Murray County Hospice, Sunrise Terrace, and at the Murray County Museum. Shirla enjoyed visiting with friends, reading, sewing, quilting, music, crocheting, knitting, and collecting salt and pepper shakers. Survivors include her two children and their spouses, David and Carol Rensink of Houston, TX and Ruthann and Roger Stoakes of Sioux Fall, SD, two granddaughters, Alison and Jeff Wharton, and Emily and Matt Taylor, and several nieces and nephews. She is preceded in death by her parents, husband, Floyd, infant sister, Shirley Schaeffer, two brothers and their spouses, Clifford and Betty Schaeffer, and Frank Jr. and Anita Schaeffer. United Methodist Church in Slayton, MN on Wednesday, August 29, 2018 at 2:00 p.m. with Ethanie Schmidt officiating. The organist is Janet Voges. The pallbearers are Jeff Wharton, Matt Taylor, Dale Schaeffer, Duane Spartz, Michael Johnson, and Jim Voges. Interment is at Slayton Memorial Gardens in Slayton, MN. Visitation will be on Tuesday, August 28, 2018 at the Totzke Funeral Home from 4-6 p.m. Visitation will also be one hour prior to the services at the church on Wednesday.